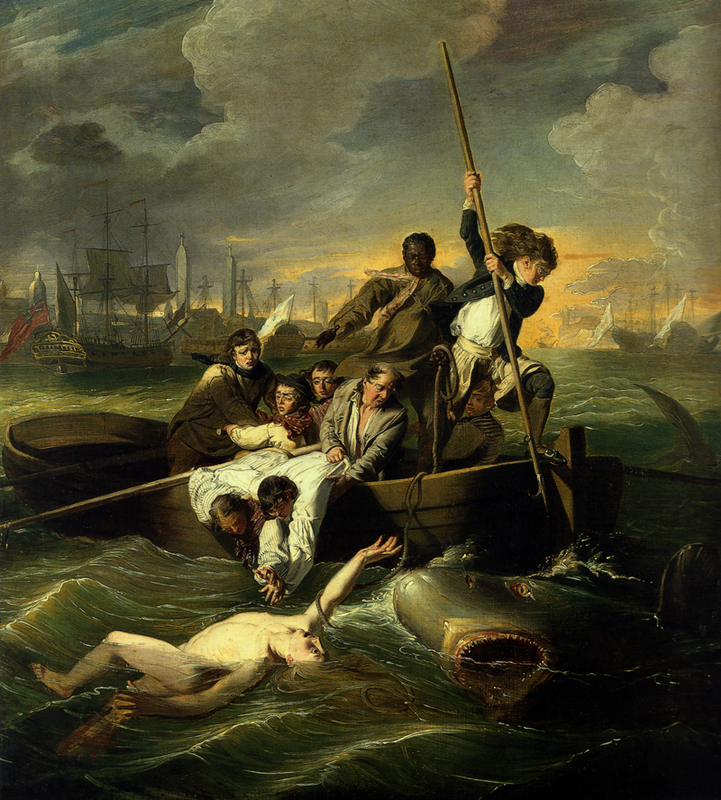 John Singleton Copley, Watson and the Shark, 1778, oil on canvas, National Gallery of Art, Washington, Ferdinand Belin Fund (1963.6.1), image courtesy of the Board of Trustees, National Gallery of Art, Washington D.C.
Next week, I’ll also share some entertaining and insightful comments from a group of kids about what they see in the painting Cliff Dwellers, by George Bellows—a favorite from LACMA’s collection that appears toward the end of American Stories. I recently stumbled across some shocking activity inside the soon-to-open Resnick Pavilion. 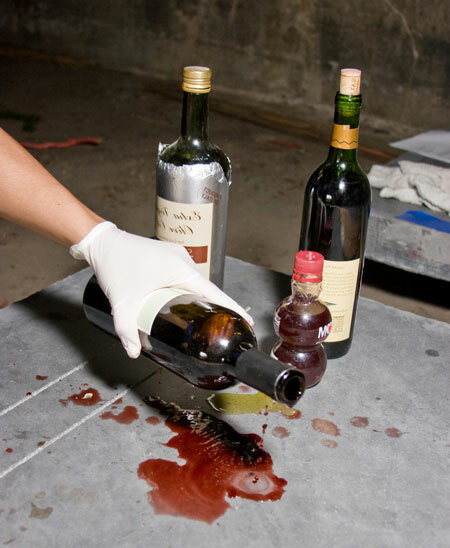 was pouring pomegranate juice, red wine, olive oil, and coffee on the gallery floor. Further investigation revealed the not-so-shocking truth: Andrew was testing the mock-up for the new floor with food—food known to stain. it to a newly waxed car: the water should bead on the surface. The type of sealant chosen invisibly saturates the porous concrete surface, restricting the ability of liquids to penetrate the floor, protecting it against staining. Andrew conceded that it was fun making a mess for once instead of cleaning one up. As museum educators, we’re always looking for ways to engage students and adults in looking at and talking about art, both here on campus and out in the community. 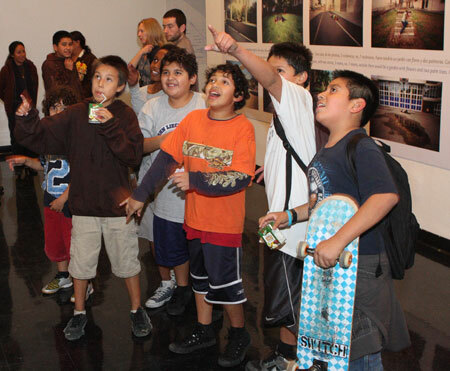 With these goals in mind, we developed Art Programs with the Community: LACMA On-site five years ago when LACMA received the largest endowment in our history ($23.9 million) from former trustee Anna Bing. Since then, we’ve been investing approximately $1 million a year in the schools and community of L.A.’s District 4—an area with a student population the size of the entire Boston public school system. This is my last week at LACMA so I thought I’d say a quick goodbye. Only a year and a half has gone by since we started Unframed but that seems like positively ages in internet time. Since then, I’ve spoken with colleagues at other museums, with college students, and aspiring social media practitioners about what we do here. When people ask what makes our blog stand out, I always say that it’s the editing. We treat the blog really seriously and I think that shows. Tom, Brooke, and Scott, editors extraordinaire and my partners on the blog, are the absolute best there is and I’ll miss our collaboration very much. I’ll also miss having the opportunity to tell you about the little-known in and outs of the museum. (This remains my favorite post I wrote for Unframed.) Our other contributors have those and other stories covered though. (I’m especially looking forward to reading American Art curator Ilene Fort’s take on the term “California artist”—stay tuned for that post.) But I won’t be too far away. In fact, I’ll still be on Wilshire Boulevard. Starting in March, I’ll be at the Hammer, working with the museum’s artist-in-residence in a curatorial capacity and also creating a new department to totally reenvision the museum experience. So, for now goodbye, though with any luck, we’ll meet again soon. A few weeks ago I was invited by LACMA’s Collections Manager, Lana Johnson, to a very special art opening in her office—a “break opening,” as in, come during your fifteen-minute coffee break. The invitation mentioned free cookies; I was sold. 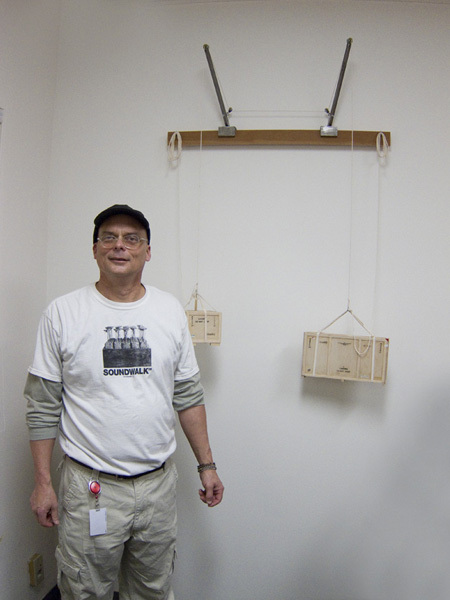 Lana had commissioned the work on view from Senior Art Preparator and artist Steve Craig. 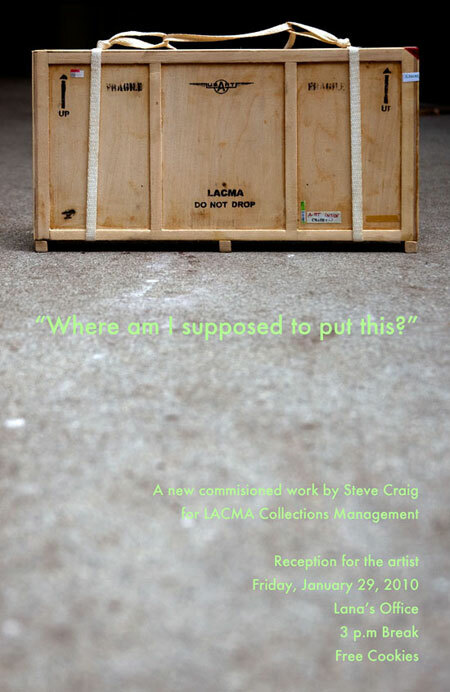 Inspiration came to Steve from a conversation with Lana where she told him of her never-ending quest to find space for the storage and protection of LACMA’s permanent collection as well as the crates that contain them—a dilemma that often prompts her to ask herself: Where am I supposed to put this? So, Steve set to work, creating “Where Am I Supposed to Put This,” an installation that consists of a wall contraption that mimics a rudimentary balance. At each side of the balance hang two small crates made to resemble those used here at the museum to transport and house artwork—logos, markings, and all. 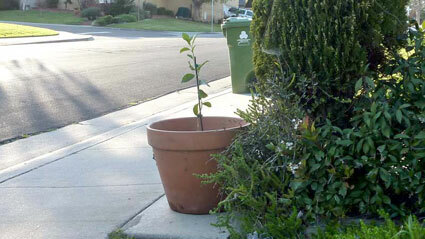 Fruit Trees: Where Are They Now? 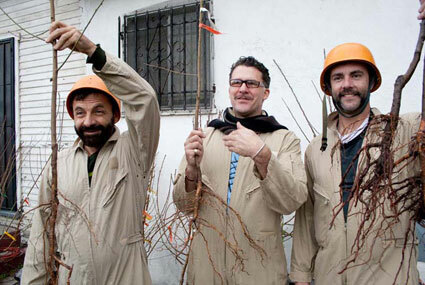 Left to right: Matias Viegener, Austin Young, and David Burns of Fallen Fruit. 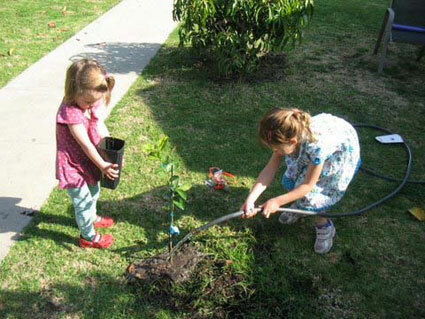 A few weeks ago, we told you about LACMA’s collaboration with Fallen Fruit and our kickoff event, the fruit tree giveaway. 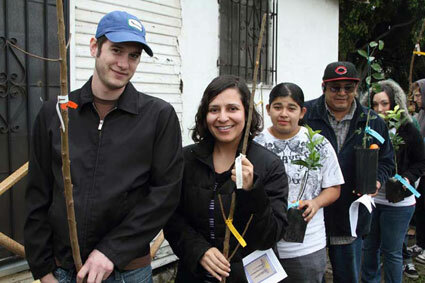 Over the course of two days, Fallen Fruit facilitated the distribution of 300 fruit trees to families who filled out adoption forms and promised to plant their tree in a public place or on the perimeter of their property. New “parents” at the Watts Towers Arts Center. With trees come stories. I’ve always been partial to the Washington Square Moon Tree in my hometown of Philadelphia, the first of many moon trees planted during the Bicentennial by astronaut Stuart Roosa, who carried the seeds on a trip to the moon to mark the contributions forests have made to our way of life. Fallen Fruit follows up with the families that adopt, and they often receive photos and stories about how the trees are doing and where they were planted. 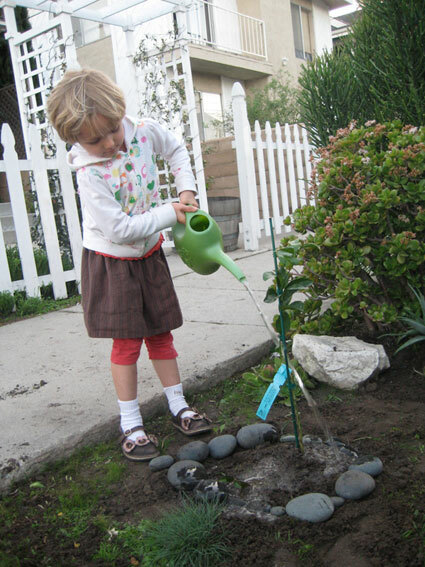 One story in particular stands out from the adoptions—Diann Bryant, who adopted in Watts surrounded by her family and friends, responded via email that she planted her Fuji apple tree in her son’s honor. He passed away four years ago to the day of the adoption. Another adopter, Kevin West, local canner and jammer, told me that he didn’t have the proper spot to make his new Cuties Clementine tree publicly accessible, but that he would use his jam-making talents to provide jars of jam for all in the neighborhood. He also wrote a post on his blog about the day including a survey of the “socio-geography” of citrus in Southern California. 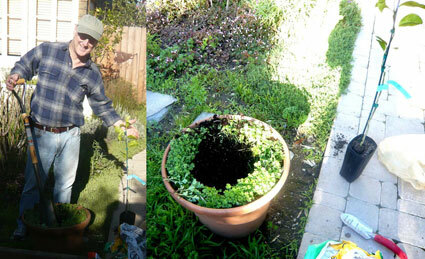 Here’s Cuties Clementine new dad Michael Kurcfeld and his tree pot with garnish. You can follow the fruit tree futures and see other photos of EATLACMA events as they happen on the EATLACMA Flickr page. Renoir wasn’t always popular. As a man who helped pioneer the age of impressionism, the artist’s dabbling in modernism was not quite met with a warm response. A decade later, author Roger Benjamin has a simple solution to those who dismissed the aging painter—look at the paintings through the eyes of Matisse, a friend and champion of Renoir. 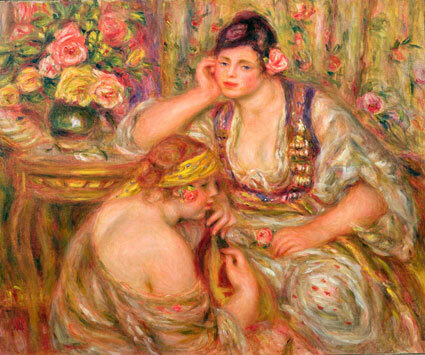 To see late Renoir through Matisse’s eyes is to love late Renoir. Benjamin’s essay, “Why Did Matisse Love Late Renoir?” in the exhibition catalogue breaks down the process nicely. You are currently browsing the Unframed The LACMA Blog blog archives for February, 2010.